Natural Fibres - what are they & why use them? Natural fibres from plants and animals play an increasing role in our lives, not only in ethical clothing and other textiles, but in unexpected areas such as the automotive industry. Find out what natural fibre really is, what synthetic fibre is and learn more about the grey area between synthetic and natural. You may be surprised to read how much natural fibre we actually use and how that has changed in the last hundred years. And most important, discover the benefits of using natural fibres in your life. The Latin word texere means ‘to weave’, and, originally, textiles were fabrics made by weaving yarns. Textiles have played a vital role in man’s lives for thousands of years. Countless hours were spent spinning yarn on drop spindles and weaving fabric, not only for clothes but for all-important boat sails. Now the word textile is used for materials manufactured from fibre or yarn by a wide variety of production methods. Textiles are usually flexible and consist of a network of interlaced or bonded fibres. Production methods are varied and include not only weaving, but also knitting, crochet, felt, bonding with heat or adhesive (e.g. silk fusion). Although the majority of textiles are produced for the clothing industry, they are also used in other areas such as the food industry (tea bags), transport (car tires, road lining), space exploration (heat shields in spacecraft), health (artificial arteries, bandages), construction industry (roofing materials) and agriculture (geo-textiles). The importance and range of uses of textiles in our lives continues to increase with advances in technology. Textile fibres are long and thin, often several hundred times longer than their thickness. To be used in textiles they need to be at least 5mm in length, so that they are long enough to be spun into yarn. They also need to be flexible and have sufficient strength. It is an added advantage if the fibre has some elasticity (the ability to stretch and then return to the original length) and lustre, and is fine and uniform. Other useful characteristics are resistance to abrasion and good absorbency. Natural fibres (or fibers) come from natural sources; cellulose from plants and protein from animals. Fibres obtained from other sources such as petrochemicals are manufactured and called synthetic fibres. Wool, cotton and linen are examples of natural fibres, while acrylic, polyester and nylon are examples of synthetic fibres. Natural plant fibres are harvested, cleaned, and separated from seeds (in the case of cotton) or from a stiff inner core (in the case of flax and other bast fibres). You can still recognise that these prepared cellulose fibres come from a particular plant. 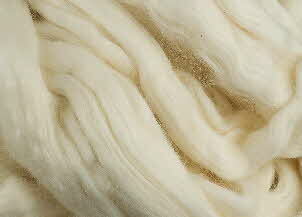 Regenerated fibres such as rayon and tencel are also made from cellulose. But does that make them natural fibres? To make rayon, shredded pieces of bamboo or another plant are made into a pulp by soaking them in chemicals which dissolve the cellulose. The pulp is forced through spinnerets in a process similar to forcing icing sugar through a nozzle. The extruded cellulose filaments go into a vat and the chemicals in the vat harden them into cellulose fibres which can be spun into yarn. You can no longer recognise these fibres as coming from a particular plant, they are processed cellulose, and are often no longer considered to be natural fibres. They are sometimes called semi-synthetic fibres. An additional type of regenerated fibre is made from soy bean or from milk protein. They are both manufactured in a similar way to bamboo, and are therefore semi-synthetic fibres.